Error: DHCP: Credentials for DNS update should be configured if secure dynamic DNS update is enabled and the domain controller is on the same host as the DHCP server. 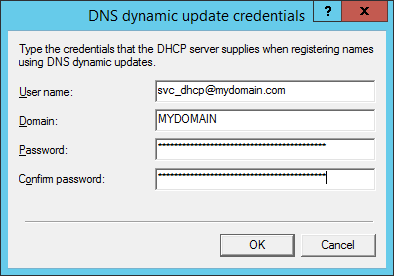 DHCP: Credentials for DNS update should be configured if secure dynamic DNS update is enabled and the domain controller is on the same host as the DHCP server. 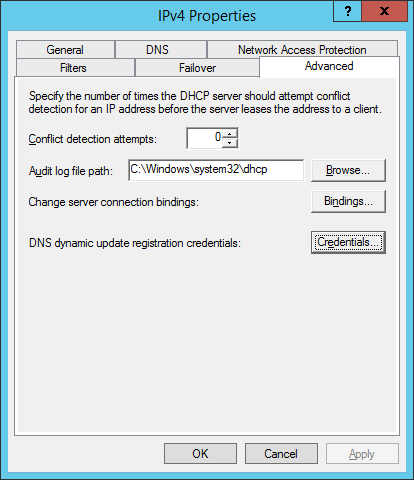 If you have the DHCP service installed on your domain controller without a service account configured, by default, DNS registrations from DHCP clients will be prevented from being registered and will log event 1056 in event viewer. Solution: Complete the following steps below to change the credentials of the service account used for DHCP. 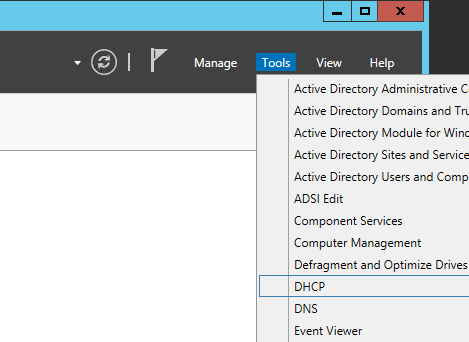 Before beginning, make sure you have a service account you can use to set the DHCP Server to run as. This account should be a domain account (not a local account) and should not have any fancy privileges (standard user account, not an administrator). 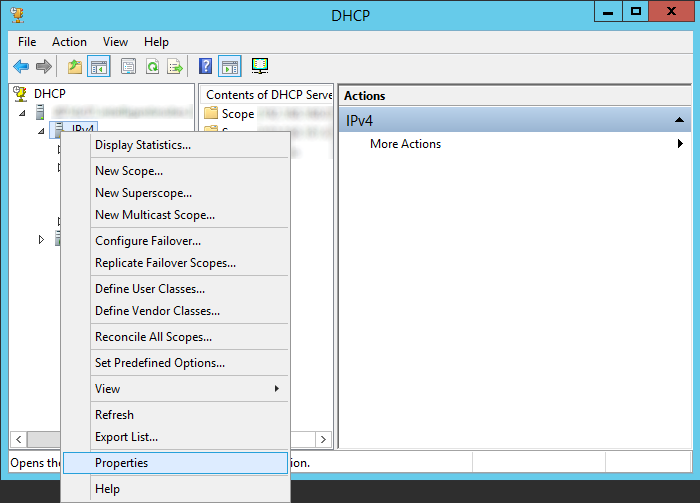 Repeat this step on each of the DHCP servers in your domain. It is recommended to use the same service account on each of the machines. This entry was posted in Uncategorized and tagged Best Practices Analyzer, BPA, dhcp, secure dynamic DNS update on November 21, 2013 by Jack. I did as described in the article, but the error hadn’t gone when running PBA scan after the change. Do I need to restart DHCP service on DHCP server ? Should I set some special permission for this account in DNS server to make it work? You will need to restart the service so that it runs under the credentials of the new user account. 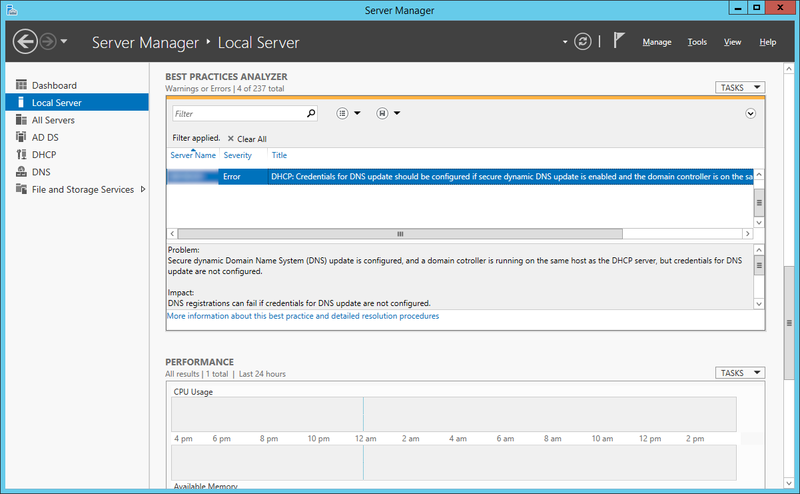 Downtime should be very minimal, especially if you have DHCP clustered in Server 2012. I created a standard domain user and entered it to start the dhcp service. With this the user got rights to logon as service on the DC but it needs some more rights to start the dhcp service. Do you know whats the best way to give the needed rights?